I'm sure a lot of you know that most mouthwashes on the market do contain some pretty icky ingredients. This is a very simple recipe to make, and it does the trick without any toxic chemicals! Mix this up very well before each use, as the oils and water naturally separate. I just used an empty vanilla extract container that I've had for a while. Your breath will smell so fresh after using this mouthwash each morning! 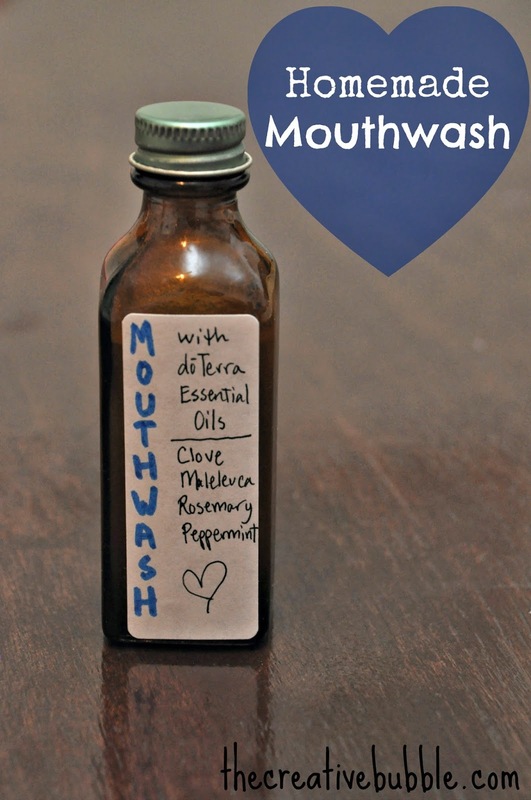 There are other homemade mouthwashes out there, but this recipe is my favorite, because it's so easy to make, the ingredients are easy to find, and it really works. The malaleuca will aid in killing nasty germs, too. Did you know that if you have a cold sore, it can also help get rid of it? Don't forget to keep it out of children's reach. I was wandering for long for the blog of this kind; appreciate your efforts to make it useful for readers like us. In past month, I went for some dental health checkup and the dentist told me to change mouthwash with toothpaste for sensitive teeth of Colgate to keep my teeth healthy. I really feel much better after their use. Hope your other readers will also get benefits from my recommendation and your views.